Preheat oven to 450°F. Make shrimp stock (just enough water to cover shells, simmer about 8 minutes, crush shells with potato masher occasionally). Strain and reserve shrimp and chicken stock. Measure rice. Heat olive oil in heavy large pot or pan over medium-high heat. Add chopped bacon and cook until fat is rendered, about 6 minutes. Using slotted spoon, transfer bacon to paper towels and drain. Set aside. Sprinkle chicken pieces with salt and pepper. Add chicken to bacon drippings in pot and cook over medium heat until brown, about 3 minutes per side [chicken will later cook 45 minutes with rice]. Using tongs, remove chicken from pot. If you are adding sausage, brown this now, except the dry chorizo sausage, which is not browned. Remove and reserve the sausage. Add it when you add the chicken. Stir in rice, most of the roasted pimientos with juices and saffron. Reserve some pimentos for garnish. Add clam juice and chicken stock [and shrimp stock and pimento juice] to pot and bring mixture to simmer. Remove from heat. Rinse and blanch asparagus. Slice pimentos/pepper, if needed. About 10 or 15 minutes before done, depending on size of shrimp, add shrimp, squid, asparagus, roasted red pepper, mussels, peas and the reserved bacon garnish. Bury most of shrimp in the rice, garnish with a few shrimp on top, and with the asparagus and roasted red pepper. 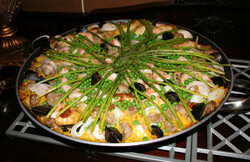 Bake paella until chicken is cooked through, clams and mussels open, rice is tender, and shrimp, squid and asparagus are cooked – about 45 minutes total. Discard any clams and mussels that do not open. Remove foil from baking dish. Let paella stand 10 minutes. Serve with lemon wedges and squeeze lemon over each serving to really bring out the flavor. This entry was posted on Friday, January 28th, 2011 at 12:01 am and is filed under . You can follow any responses to this entry through the RSS 2.0 feed. You can leave a response, or trackback from your own site.